Academic libraries in the UK are placing an increased emphasis on engagement and partnership building with academics. Attempts to articulate what is meant by this engagement rely on analogies from the commercial world, notably from sales- driven environments. This language can prove counteractive to true faculty engagement. It retains a focus on a transactional approach to the detriment of partnership and often alienates academics (and librarians) reacting against their increasingly marketised and managerialised institutions. Therefore, we argue that it is necessary to abandon the technical vocabulary of sales and customer relations and develop better analogies to describe library liaison work. Academic libraries are seeking organisational structures that reflect how they work. The trend in many United Kingdom (UK) Higher Education (HE) libraries is to adopt structures based around functional specialisms aimed at highlighting expanding support for research and learning & teaching. This expansion often involves the reduction, restructuring, or outright removal of subject-focused teams who, within the library, have traditionally carried out liaison programmes. A functional – or hybrid-functional – library structure, therefore, raises the question of who should be responsible for faculty liaison, with the implication being that this organisational change requires a re-conceptualisation of liaison work. Whether libraries have specialist customer relationship management (CRM) —1 — teams, or rely on subject or functional specialist teams to undertake the work, library leaders are looking for library-faculty engagement to demonstrates its value to the library and the wider institution. Nevertheless, it is notable that very few library documents made available publically via their websites have explicitly defined what is meant by this engagement (Corrall 2015). Attempts to articulate the requirements of liaison work can be problematic, and met with resistance. Library leaders will try to map this work onto commercial examples relying on comparisons with corporate sales forces and business consultancies. Librarians asked to undertake work under this paradigm will resist because commercialism clashes with their self-image of what they believe librarianship represents (King & Solis 2017). A response to this is to demand that librarians either develop these new selling and CRM skills or to appoint people who are more comfortable with commercial analogies to engagement roles. However, while some resistance is likely curmudgeonliness, there is a legitimate concern that underpins this. Managerial language, and corporate ways of thinking, damage the kind of lasting partnerships that liaison programmes are trying to develop. As Craig Brandist (2016) noted when surveying the alienating nature of the UK HE landscape as a whole, “The encroachment of the managerial logic… leads to the erosion of fundamental features that escape audit: professional integrity and collegiality”. This article will look at existing conceptions of liaison work, and a project undertaken at the University of Sheffield to better articulate it in a language that is understandable within the Library and that enables rather than inhibits existing relationships. We will then draw upon reflections from the recent Relationship Management in HE Libraries Conference, and the views of commentators, to propose more useful ways of analogising library engagement for the future. Our argument is that sales and managerial language is counter-productive to the aims of faculty engagement. Firstly, because it is alienating to academic staff who are already alienated within the marketised university. Secondly, because the language of sales and management is contrived and unsuitable for the kind of conversations that are the basis of good relationships. Therefore, we propose a less formal approach, using ordinary language and conceived of with different analogies that better describe library-faculty liaison work. The University of Sheffield Library, like many institutions, has been through several iterations of the subject versus functional library liaison structure. In 2016, a hybrid structure was developed which retained subject liaison librarians (the Faculty Engagement Team) whilst creating specialist research and learning & teaching library teams. In this new environment, excellent communication was needed across teams to ensure that outward engagement and specialist knowledge were joined up and work seamlessly together to deliver the library’s strategic objectives and build partnerships. A project was undertaken by members of the Faculty Engagement Team to assess communication channels, and to look at how strong partnerships could be built not only externally with academic staff and students, but internally within the whole library. During part of this project, the need to articulate the role of the Faculty Engagement Team to other library staff became apparent. While members of the team outwardly still held the same roles and job titles, the focus of their work and responsibilities has evolved over time. For other library staff this evolution hadn’t always been immediately obvious. As functional specialisms were drawn away from the Faculty Engagement Team, their day-to-day interactions with other library teams lessened. This had the effect of creating a perceived distance between different sections of the library. As part of the project, interviews were conducted with representatives from each distinct team in the library to discuss how library staff saw the Faculty Engagement Team’s role within the overall library structure and importantly how this related to their work and areas of expertise. A training session was also delivered to all library staff (as part of the regular staff training hour) to present on the work of the Faculty Engagement Team. During this training session, the Team sought analogies to articulate the scope and purpose of liaison work by grounding them in practical examples of what engagement and relationship management looks like in the library environment. The necessity to analogise liaison work within academic libraries probably stems from the failure to explicitly articulate it within publically-available policy documents (Corrall 2015). It is also work that does not rely on a technical specialism of librarianship and can usefully draw on examples from other professions. Liaison programmes vary in scope and focus across different institutions, but certain analogies seem to predominate. The idea that librarians – specifically liaison librarians – should ‘sell’ the library has been contentious. Jaguszewski and Williams (2013) conceive of this ‘Sales Force’ role as being one of advocacy and ambassadorship. The contention appears to arise out of the language rather than the practice. Sell (2018) can mean both “to sell for a price” or “to convince of the worth of”. Perhaps because they fixate on the commercial definition, librarians largely do not to like to be told they are selling (King & Solis 2017). While library directors often appreciate this approach as giving a businesslike quality to library services that plays well with wider institutional leadership, it can be problematic in building relationships with faculty. Academics do not like being sold to as much as librarians do not like selling. An overtly commercial approach is equated with marketisation which is a trend that alienates academics (Hall 2018). Similarly, the notion that liaison programmes are ‘selling’ the library produces an expectation in specialist library teams that some kind of ‘sale’ will be made. This encourages a transactional conception of engagement work that is unrealistic. Chung (2010) noted that little could be done in liaison work to control the arrival of engagement opportunities, and that the nature of the work is opportunistic. Libraries need to be in a position to take advantage of these opportunities by establishing deep relationships with faculty. This needs to be achieved on a human level and using natural language. There is a debate to be had elsewhere about the deep ideological impact of marketisation on UK HE but our experience at the University of Sheffield has taught us that explicit reference to this is not the answer. Doctrinal discussions about neoliberalism also rely on specialist language that can alienate. Good faculty engagement is an informal thing. It is more complicated than a rejection of commercialism, and much more complicated than going out and selling a particular project, service or, initiative. Academic libraries are also increasingly interested in the notion of customer relationship management. Again, with the notion that the ideas and practices developed in commercial businesses can be applied within HE. Developing and managing relationships has always been an implied part of the liaison role within libraries, but the desire now appears to be for a more systematic approach to allow for the creation of strategic alliances within the university (Robertson 2018). However, the terminology here, arising again from the private sector, is also troublesome for the stated objective. CRM conceives of library users as customers. This conception necessarily makes the customer external to library rather than part of its community. Faculty do not want to be thought of as customers and where academic libraries have been looking to establish effective partnerships they have found it prudent not to refer to library-faculty interactions as CRM (Ashmore, McKeating & Young 2017). Not only is the language alienating but the practices of CRM also need to be considered. This is especially relevant for libraries where ethical standards around information and data are essential. If described badly, the practice of collecting ‘intelligence’ on faculty can sound sinister. 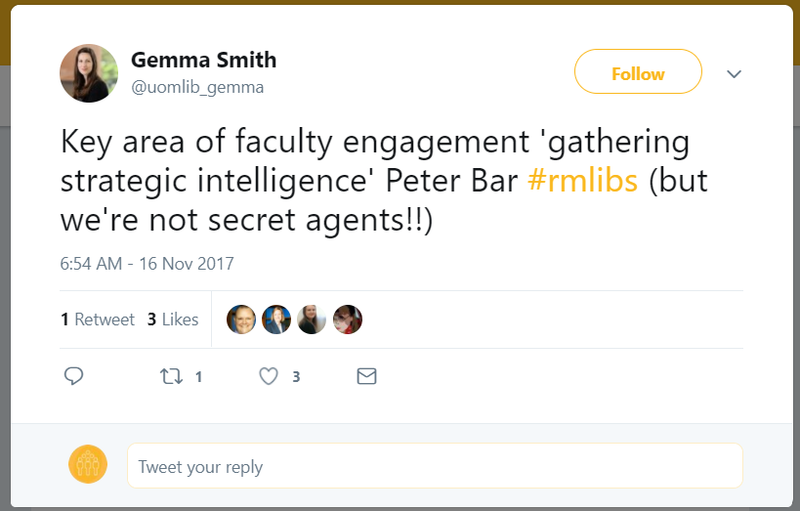 Attendees at the October 2017 Relationship Management in Higher Education Libraries Conference reacted to the commercial idea of “strategic intelligence” by equating the language to that of government intelligence agencies. The tweets shown below highlight that if the terminology used to consider faculty engagement cannot be taken seriously then it has passed its usefulness. Caption for Figures 1 & 2: Gemma Smith (University of Manchester) and Kevin Wilson (London School of Economics) produce the Spy analogy in reaction to the idea of strategic Intelligence in academic libraries at 2nd Annual Relationship Management in Higher Education Libraries Conference. Tweets included with authors’ permissions. Overly systematic approaches can make interactions overly transactional and have the potential to undermine the human-to-human interaction that forms the basis of any relationship between the library and faculty. Similarly, where CRM becomes a functional specialism of a distinct library team there is the potential for them to become devalued as professionals. At its worst, such teams function as a mere go-between faculty and the specialist teams that provide services. This has been analogised as librarians acting as ‘middleware’ that is required for one system to work with another, but again this is not necessarily an appealing metaphor (Whatley 2009). For liaison work to be effective it needs to include a proactive element. This includes, what Anne Kenney (2015) terms, “looking upstream” to predict new trends and identify opportunities where libraries can engage. Examples of this would be the expansion of research data management within many academic libraries, or the growing offer of library services around student and researcher wellbeing. Proactivity also includes engaging to understand and — if necessary — change faculty behaviour to prepare for oncoming changes. Commercial language is rejected when it clashes with the professional self-image of librarians. However, the entirely altruistic, ‘saintly’ conception of librarianship can also present difficulties in the context of library-faculty liaison. This is the idea that libraries have a pseudo-sacred duty that they execute for higher purposes than praise or reward. Inherent in this is a meekness to seek this praise because to do so would lessen the virtue of librarianship. Fobazi Ettarh (2018) has written persuasively about the problems that arise from vocational awe, but the particular problem is that meekness damages the ability to build relationships. Simply expressed the problem is: “How can we advocate for [the library], when the successful interaction… has the patron believing that they’ve done it all by themselves?” (Emmelhainz, Seale & Pappas 2017). Therefore, there is a need for a more proactive approach, which is seen as not being encompassed by traditional librarianship. Perhaps this explains why there is a reliance on analogies from the more aggressive, proactive world of sales. 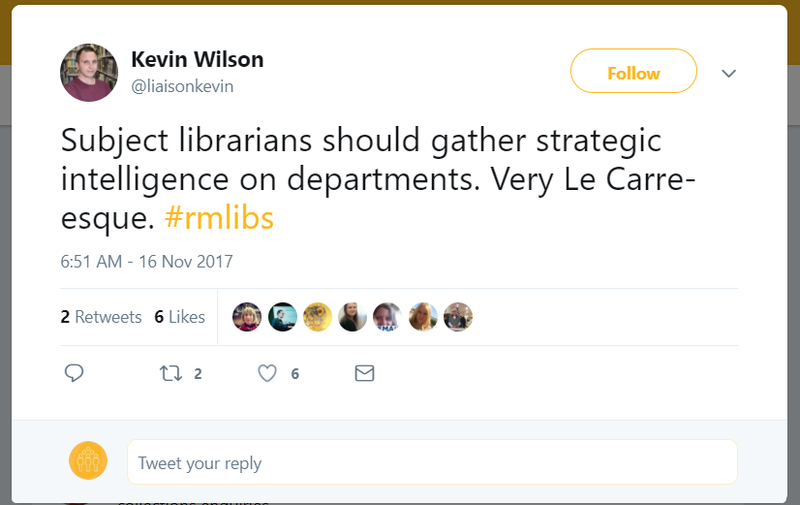 However, the benevolent aspect of librarianship cannot be lost if “library liaisons [are to] play a key role in revitalizing human-to-human interactions [at their institutions]” (Kenney 2015). The changing role of subject librarians has affected liaison work. The move to functional structures is largely motivated by operational concerns, but implied is the idea that subject- focused teams are not developing the relationships required for a modern academic library (Cooper & Schonfeld 2017). A study of the subject to functional shift in UK HE libraries found that it was principally motivated by the problem of subject librarians fighting for departmental interests to the detriment of wider library strategy and that a functional library structure is equated with innovation and the desired consistency of service (Hoodless & Pinfield 2016). The issue raised by this approach, in relation to liaison work, is that it relies on organisational structure rather than individuals, which undermines the ability for deep engagement through personal relationships. UK HE libraries that have kept subject teams have done so to maintain this personal connection with departments (Hoodless & Pinfield 2016). It also implies that management does not trust its liaison librarians to act in the library’s best interest. This implication is necessarily pernicious. While library managers increasingly seem to value functional specialists, it appears not to be a view predominantly shared by faculty. The loss of subject-specific knowledge in librarians is often equated – by academics – with a reduction in quality of the service (Doskatsch 2007). Equally, the specialisms that academic libraries have promoted are not those most valued by faculty. Anne Kenney (2015) has argued that “the role of library liaisons appears to be growing, but the emphasis is tightly coupled with teaching and learning rather than research,” and implies that this development is because teaching support is what academics value most about their relationship with the library. However, library services are seeking to move the conversation beyond this as they develop support for “research data management practices, bibliometrics, data repositories, digital humanities and digital rights management” (Robertson 2018). The ability to understand disciplinary issues is bound up with the idea of subject librarianship and is where faculty assume this knowledge lies. They do not consider overt CRM to be a separate specialism that the library should invest in (Brown et al. 2017). There is then an evolutionary development of liaison work required within the context of changing library structures. It does not follow that this requires a new conception of librarianship when so many aspects of the subject specialist role are highly regarded by academics. While many of the analogies above provided a useful starting point for articulating the work of Sheffield’s Faculty Engagement Team, the discussion shows that each came with limitations and no single analogy satisfactorily captured the variety of human interaction implicit in liaison activity. For an internal staff training event, they also focused too much on grand theories of how libraries should be structured, rather than the reality of what librarians are doing on the ground. We therefore presented multiple analogies to describe the work we did as the Faculty Engagement Team, including some of the well-used examples above but also more personal analogies on how we engaged with faculties and the rest of the library. Crucially, each analogy articulated not just successful, one-size-fits-all engagement but also challenges and sometimes divergence amongst disciplines and individual staff members. Similar to the concept of ‘spies’ explored above, the anthropologist suggests a slightly less sinister approach to understanding the academic and organizational cultures of different disciplines and departments. An understanding of these cultures is essential in order to design library services that meet the needs of the institution and this is best done by subject librarians working alongside academics, as integrated members of the departments. Recent library research, particularly around user experience, has focused on ethnography as an explicit methodology rather than a descriptive analogy (Priestner & Borg 2016). This is too formal and it is the nuance of the anthropologist analogy that is sought. However, the image of an embedded anthropologist can be used pejoratively to warn of the risk of subject librarians becoming too attached to their disciplines and putting academic interests ahead of the library’s wider business strategy. As discussed, this fear ignores the professionalism most librarians exhibit and also presumes a fundamental clash between the library and academic interests. In reality, libraries and departments are continually acting in partnership with one another and any examples of subject librarians becoming estranged from the rest of the library team can be seen as much as a breakdown in internal communication and engagement rather than as a failure of external library liaison. While the salesman analogy provides a simple way to describe how faculty engagement can be used to ‘sell’ the services and expertise of the library, it can be an alienating concept for both librarians and academic departments. Encouraging discussion amongst library staff should be encouraged not just within liaison teams but also with all teams. This allows for a more nuanced view on what this aspect of engagement means and how far it should go. In Sheffield, the analogy was also contrasted with the analogy of the playmaker in football (soccer). Here, the focus is on setting up partnership opportunities (goals) for other specialist library teams. This suggests a more collaborative approach of beneficial engagement. The sale is the end of the process in retail. The library ‘sale’ in faculty engagement terms is the creation of an opportunity, which is what the playmaker attempts to achieve for his, her, or their teammates in football. Those involved in liaison activities are often essentially acting as the face of the library. Particularly for academic staff, their subject librarian is their first point of contact and liaison librarians represent the library at departmental and faculty meetings. This involves promoting the library services but also at times acting as a peacemaker to resolve negative experiences or frustrations that academics or students may have. This is where the human element of liaison work really comes into its own. As large organisations, HE libraries need to maintain a fine balance between competing interests in order to deliver effective service.To an outsider unaware of the broader context or complexities, some aspects of the library’s service may at times seem bewildering. Being able to engage with a single trusted individual who can demystify bureaucratic processes and structures goes a long way in solving difficulties. As a personalised point of contact liaison librarians can also offer support that goes beyond what staff or students may experience from a wider more impersonal library service. For example, in Sheffield, the Faculty Engagement Team is responsible for providing one-on-one information skills support for students and researchers, allowing relationships to be built with our faculties at a very individual level. Often providing reassurance as much as anything else, one-on-one appointments with students and researchers are not about selling or furthering strategic objectives but doing what academic libraries do best; giving friendly and professional advice for those engaged in scholarship. In the same way, the liaison librarian’s role when out and about in academic departments flourishes by our ability to offer trusted impartial advice and to be supportive of the teaching and research activities in the department. Analogies of liaison librarianship can be very useful but care needs to be taken around which analogies are chosen. It is important that they are kept in context, that they are seen as ways of describing the work not as models of practice. Faculty engagement is based around human relationships and therefore — as articulated by the scope of analogies in this article — requires a variety of approaches. Perhaps the desire to analogise the work of the liaison librarians (and librarianship as a whole) stems from a lack of confidence. It is assumed that the library’s contribution is not understood, and will not be understood, because of the difficulty in fully articulating it. This would explain the attachment to saintly analogy as an internalisation of this lack of confidence: librarians must work furtively to understand their users and suffer a mild (ongoing) professional martyrdom as they complete their misunderstood work. Attempts to develop new conceptions of library liaison programmes begin from a premise that they are failing. There is an idea that they are not achieving what library directors require of them. Attitudinally, this is the wrong way to consider it. For the most part, the work of liaison librarians is highly appreciated. It is appreciated both, by functional teams who do not have the skills or time to build individual relationships, and by academics. Faculty want to build relationships with people in the library, as they do with their academic colleagues, not with a CRM system or a sales force. It is in this regard that the established analogies can become damaging. The fractious nature of the relationship between libraries and publishing companies’ sales teams should be illustrative in this regard. The sales analogy stems from the notion of the library as an unequal partner trying to offer value-added services, rather than an integral part of research and learning within a university. The behaviour of aggressive sales representatives is not trusted or seen in the best interest of the library. Customers have a very different relationship with salespeople than partnerships built on genuine mutual interest. While our research is not comprehensive, it is not necessary to conceive of a universal model for liaison programmes. This may be uncomfortable for library managers but relationship building is based upon opportunistic and intuitive approaches. Our experience tells us that what people value most about librarians is their professional ethos, their expertise, and the time they make to understand problems in context. While analogies are useful, arguably librarians do not have to conceive of themselves as anything other than librarians. A desire to create complicated processes, reporting structures, or to explain the work in terms other than that of library work could stem from this lack of cultural self-confidence. It is people, not organisational structures that will build meaningful relationships with academics. This is achieved through a variety of messy, opportunistic means that cannot be usefully captured by changing what librarians are called or how they are described to users. Academic libraries need to be confident enough to trust that this engagement is occurring. They should definitely have internal means of sharing and analysing this knowledge, but they need to have a more nuanced way of how they present this back to their users. There is one conversation to be had at official level where – especially in managerialised UK HE – business and commercial analogies may be useful, but the conversations with academics need to occur at a personal level and require a different vocabulary. It is with academics as people – not as producers of research output or mere operatives within the academic machine – that a library’s success depends. To achieve this, liaison librarians need to build a greater depth of feeling than a salesperson has with a customer. Liaison work encompasses caring aspects, intuitive aspects, explorative aspects underpinned by authentic communication and professional expertise. These, as we have demonstrated, should be explained in less commercially analogous ways. They should also be confidently expressed from a position that understands the value libraries and librarians add to the HE environment. This confidence, properly situated, does not underplay the worth of library liaison work with saintly and fatalistic analogies. It is not necessary for librarians to conceive of themselves as salespeople, or relationship managers, but to understand the qualities these analogies seek to articulate. Librarians have always ‘sold’ library services to academics, and have always ‘managed’ their relationships with faculties, but they have done so within the wider holistic identity of the profession. Libraries require a more complex vocabulary than businesses for articulating their work. Thank you to our amazing colleagues in the Faculty Engagement Team at the University of Sheffield whose work underpins this article. Also, thank you to the attendees at the Relationship Management in HE Libraries conference whose comments and feedback shaped the development of our thinking beyond the initial project at Sheffield. Specifics thanks to Kevin Wilson and Gemma Smith for allowing the inclusion of their tweets. We would also like to thank our editorial team (peer reviewers Jennifer Garrett and Kellee Warren, and editor Sofia Leung) for keeping the article coherent and bringing it to publication. Brown, R. E., Cyrus, J., Lubker, I, Gau, K., Opoku, J., Wright B & Hurst, E. J. (2017) Seeing the Big Picture: Sustaining Success in Liaison Services. Medical Reference Services Quarterly, 36(3), pp. 240–52, doi:10.1080/02763869.2017.1332148. Chung, H. D. (2010). Relationship Building in Entrepreneurship Liaison Work: One Business Librarian’s Experience at North Carolina State University. Journal of Business & Finance Librarianship, 15(3-4), pp. 161–70, doi:10.1080/08963568.2010.487432. Cooper, D. & Schonfeld, R.C. (2017) Rethinking Liaison Programs for the Humanities. Ithaka S+R:http://www.sr.ithaka.org/wp-content/uploads/2017/07/SR_Issue_Brief_Reorganizing_Subejct_Expertise_07262017.pdf. Corrall, S. (2015) Capturing the Contribution of Subject Librarians. Library Management. 36(3), pp. 223–34, doi:10.1108/LM-09-2014-0101. Doskatsch, I. (2007) From flying solo to playing as a team. Library Management 28(8-9), pp.460–473. Hoodless, C. & Pinfield, S. (2016) Subject vs. Functional: Should Subject Librarians Be Replaced by Functional Specialists in Academic Libraries? Journal of Librarianship and Information Science: doi:10.1177/0961000616653647. Jaguszewski, J. M. & Williams, K. (2013) New Roles for New Times: Transforming Liaison Roles in Research Libraries. Washington, DC: Association of Research Libraries: http://www.arl.org/component/content/article/6/2893 . Kenney, A. R. (2015) From Engaging Liaison Librarians to Engaging Communities. College & Research Libraries, 76(3), pp. 386–91, doi:10.5860/crl.76.3.386. Robertson, S. (2018). Exploring the Efficacy of Training and Development for Liaison Librarians at Deakin University, Australia. Journal of Higher Education Policy and Management, 40(2), pp. 107–20, doi:10.1080/1360080X.2018.1426370. “sell, n.1” (2018). OED Online. Oxford: Oxford University Press. http://www.oed.com/view/Entry/175502?rskey=gQ7vbu&result=1&isAdvanced=false (accessed July 27, 2018). I found your piece extremely interesting and it certainly provides much to consider. While I agree that librarians need to develop various methods of engagement with faculty, I am less reluctant to accept your argument that ‘sales and managerial language is counter-productive to the aims of faculty engagement’ and that the ‘language of sales and management is contrived and unsuitable for the kind of conversations that are the basis of good relationships’. I currently work as a business subject librarian in a public university library where the traditional subject-focused team is still in place. Acting as the sole point of contact with the business school is a large part of my day-to-day role. Prior to this, I spent six years working in an academic library within the private sector. I am certainly of the opinion that my time spent in the private sector has wholly informed my approach toward faculty within the university business school. My normal ‘operating mode’ is to use a business language where appropriate and to be direct in my correspondence with faculty. For example, if I arrange an appointment with a faculty member, normal practice would be to include an agenda. In my opinion, this provides structure and reassurance for both the faculty member and myself. Perhaps, upon reflection, I am trying to balance the dual roles of traditional subject librarian and specialist customer relationship management consultant. To my mind, this is a necessary evolution and one, which brings with it the need to employ certain strategies or techniques. At no point would I consider my use of language to be contrived or unsuitable. Given the breadth of my role and responsibility, I find the ability to speak my mind and be direct in my approach affords the opportunity to perform well in my role but also opens up other opportunities in terms of research collaboration. I can point to several examples of the latter. I have a particular interest in marketing. Last year, I wrote a piece on strategic marketing for libraries. The aim of such was to promote the idea that marketing does not necessarily need to have negative connotations when associated with libraries. Marketing has become a completely necessary part of how academic libraries operate and fundamental when trying to position academic libraries within the university as a whole. You mentioned several existing analogies within your piece and two stood out above the rest, ‘salespeople’ and ‘saints’. Using marketing as an example, if all academic libraries adopted the approach of ‘saints’, there may well be no marketing and therefore no strategic positioning. Marketing is selling, and I believe that all librarians are ‘salespeople’ to some extent. However, this is not a negative! Our ability to promote the best of what libraries have to offer, not only enables us to retain our resources in a time of budgetary constraint, it allows us to increase our visibility within the university and opens the door to further opportunities outside of the library walls. Therefore, as I mentioned earlier, in my position, the ability to move between traditional subject librarian and ‘consultant’ contributes to my value proposition as the business librarian and promotes the depth of my knowledge. Both require different approaches and personas. However, once done well and with consideration, it can be very effective. In summation, perhaps the suitability of sales and managerial language to faculty engagement is more relevant to a business librarian. However, I do not think the concept of strategic thinking and a commercial approach to other disciplines should be dismissed or considered a negative. I welcome your work as it provides a forum to discuss a subject that seems to be appearing on a more frequent basis and has implications on a much wider level for how academic libraries evolve. Thanks for your comment Ronan. We were not trying to propose a universal analogy for faculty liaison, just to widen the debate. Fundamentally, the pursuit is contextual and the language and techniques you use are entirely dependent on who you are dealing with. Therefore, I absolutely accept that a commercial approach may be most effective in your circumstances. However it is interesting to see some of the things you naturally equate with being business like – meeting agendas, strategic thinking, marketing. It is possible – I would argue – to do all these things in a less overtly commercial way. We do. Our experiences (grounded in our context) told us that academics don’t conceive of themselves as our customers. Thanks a lot for the text. I think it had high value. Analogies need to be questioned if they truly are matching to the situation at hand or the situation aimed for. “Customer” and “partner”, for instance, describe very different relations. You cannot use the former term and want the latter relation. Language must reflect the situation.